This novel was perhaps the most daring and affirmative LGBT literature of the first two decades of the 20th century in America. In this story, Bertram Cope is a young college instructor, about twenty-four years old ("certainly not a day over twenty-five"), who is pursued by men and women, both younger and older than himself. In writing this novel, Fuller had to carefuly craft his plot schemes so as not to offend the sensibilities of publishers. As a result, today's reader is left somewhat, but not entirely, confused about the precise feelings that characters develop for one another by the end of the book. Nevertheless, no publishing house would touch it, which ultimately required that Fuller go the self-publishing route. 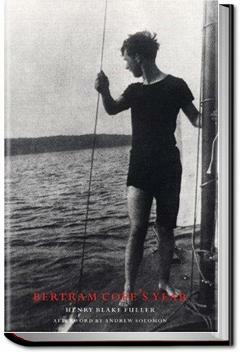 Bertram Cope's Year was the first novel by an established American writer that dealt exclusively with the subject of homosexuality. Although it did not achieve the notariety it deserved at the time, it set the tone for the increasingly open discussion of gay themes in literary form. . . .If they insist, leave your voice behind; but do bring your hands and your reading eye. Don't let me go along making my new circle think I'm an utter dub. Tell your father plainly that he can never in the world make a wholesale- hardware-man out of you. Force him to listen to reason. What is one year spent in finding out just what you are fit for? Come along; I miss you like the devil; nobody does my things as sympathetically as you do. Give up your old anthems and your old tinware and tenpennies and come along. I can bolt from this hole at a week's notice, and we can go into quarters together: a real bed instead of an upholstered shelf, and a closet big enough for two wardrobes (if mine really deserves the name). We could get our own breakfast, and you could take a course in something or other till you found out just what the Big Town could do for you. In any event you would be bearing me company, and your company is what I need. So pack up and appear." I find it hard to believe that this book was written in 1919. More unbelievable still is that the author, Henry Fuller Blake, praised by many of his more illustrious contemporaries such as Thornton Wilder and Booth Tarkington, sank into almost total obscurity. I'm surprise I never came across this masterpiece.